A roundtable aimed at seeking potential collaborations with partners to advance EU-China cooperation on urbanisation took place on April 1 at the Crowne Plaza Lake Malaren in Shanghai. It was organised by the China-Europa Forum (CEF) and the China Centre for Urban Development (CCUD). 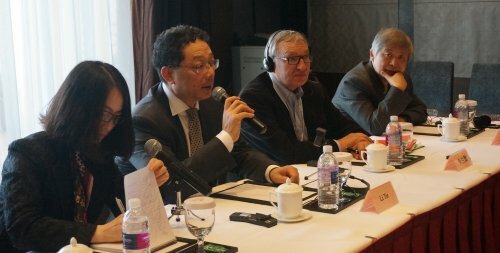 After the 2013 China International Urbanisation Forum on March 30 and 31, the CEF took the opportunity of bringing together more than 30 Chinese and European urban partners to share existing initiatives and experiences on EU-China urbanisation collaborations. Key issues included how participants could contribute to the EU-China partnership on urbanisation and how to work together in the future. Mr LI Tie, Director General of the China Centre for Urban Development (CCUD) of the National Development and Reform Commission (NDRC), highlighted developments in cooperation between the NDRC and the DG Energy of the European Commission within the framework of EU-China Urbanisation Partnership as well as several plans for the near future. Mr Li said that one of the priorities for 2013 would be the EU-China Urbanisation Summit which was expected to take place in autumn in China. He hoped to establish increasing cooperation between European and Chinese civilian organisations and local authorities and appreciated the CEF’s initiative bringing urban experts together in Shanghai to exchange points of view. He expected the EU-China urbanisation cooperation projects to be more in-depth and pragmatic. Mr Calame, President of the CEF Foundation, estimated that the EU-China Urbanisation Partnership had two dimensions: on the one hand it enabled China to draw lessons from European experiences whether successes or failures, and on the other it allowed China and Europe to debate means of facing common challenges in the future. He underlined the fact that the CEF was a platform for EU-China dialogues and exchanges in this matter and would like to do its best to promote EU-China urbanisation cooperation projects in order to develop sustainable societies. The other participants of the roundtable offered their points of view regarding future cooperation on issues such as urban transport, urban planning, sustainable food chains, community building, public services, education, energy, evaluation of city quality, and the like. Representatives of a dozen organisations took part in the discussions including the CCUD, Tongji University, Fuzhou Planning and Design Institute, the Development Research Centre of the State Council, Southwest Jiaotong University, the Sichuan Administration Institute, the Chinese Academy of Social Sciences, the Chengdu Urban Rivers Association, Shanghai Real Estate Limited, the European New Towns and Pilot Cities Platform（ENTP), Reconstruire l’action publique（RAP) ，the French Ministry of Ecology, Energy and Sustainable Development, the French Inter-Ministerial Steering Committee of the French-Chinese Agreement on Sustainable Urban Development, the Project Team of the Swiss Federal Institute of Technology Lausanne and the University of Lausanne, the Consortium Risteco, Urban Language (Rotterdam & Shanghai), Le Pont des Arts Limited, European Urban Design Lab in Tilburg (Netherlands) and the Embassy of Sweden. Dr CHEN Yan, Executive President of the CEF, and Ms Min YAN, Coordinator for Europe in Brussels and representatives of the Beijing Office, also attended the meeting.